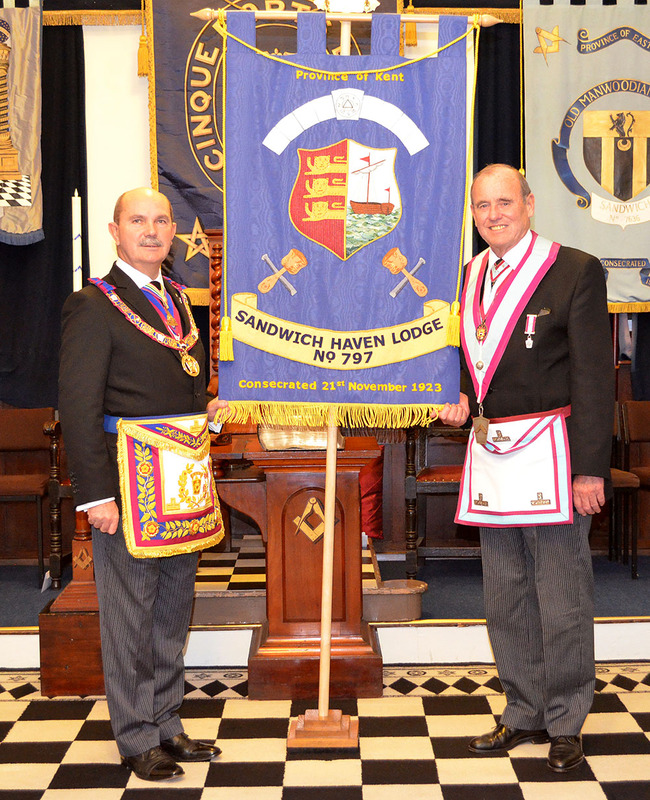 On Tuesday 27 October 2015, The Provincial Grand Master, RW Bro Archibald Iain Torrance, and a delegation of Provincial Officers attended a meeting of Sandwich Haven Mark Lodge, when the PGM was pleased to dedicate the new Lodge Banner in front of a packed Temple. The banner had been made by Mrs Janet Stiff. Once again, the beauty and detail fashioned by Janet stunned the audience and left many feeling more than a little envious! By way of thanking the PGM for his efforts, the Lodge made a tremendous donation of £500 to the 2020 Festival. The evening was rounded off with 47 Brethren enjoying a convivial Festive Board. The pictures show the Lodge and dedicating team after the meeting and also the Worshipful Master, WBro Robert Adamson, standing with the PGM, proudly displaying the new banner.